A motorist who fled a traffic stop Monday in Otay Mesa led deputies on a brief pursuit that ended when he got into a crash that left him and his two passengers seriously injured, authorities reported. Deputies spotted the suspect’s pickup truck about 2 p.m. in the area of Caliente Avenue and Otay Mesa Road and pulled it over for a minor traffic infraction, according to San Diego County sheriff‘s Lt. Jason Vickery. The driver, later identified as 26-year-old Christian Eduardo Saldana Medina, initially yielded and was cooperative but while deputies were conducting record checks, “Medina suddenly sped off … at a high rate of speed in an attempt to get away,” Vickery said. 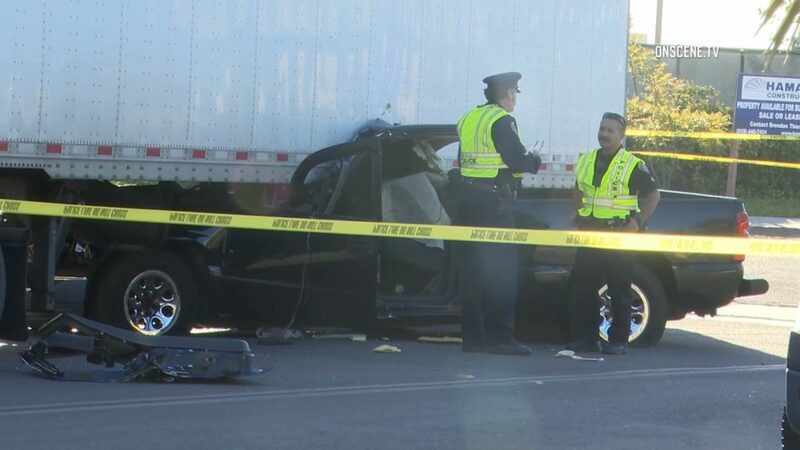 “The deputies pursued the vehicle for about one and a half miles until Medina collided into a tractor-trailer at the corner of Pacific Rim Court and Camino Maquiladora,” near Brown Field Municipal Airport, Vickery said. The pickup became wedged beneath the big rig’s trailer, Vickery said. Emergency crews freed the three occupants of the crumpled vehicle from the wreckage, after which medics took them to a hospital, the most badly hurt one via air ambulance. One of the men appeared to be so badly injured he might not survive, San Diego Fire-Rescue Department Battalion Chief Dan Eddy told reporters. Medina was arrested on suspicion of felony evading and felony evading with injury and one of the passengers, identified as 38-year-old Edgar Quintana Valenzuela, was arrested on suspicion of possession of a controlled substance and possession of drug paraphernalia, Vickery said, adding that the other passenger in the pickup was not arrested. Updated at 10:15 p.m. on Nov. 26, 2018.